Surge protection is a major issue in home with expensive electrical equipment. Most people only think about their televisions and computers when it comes to surge protection but the truth is any electrical appliance that you have is vulnerable to surge damage. That means your air conditioner, refrigerator, water heater, hot tub, freezer – anything that needs electricity, needs protection. Our San Ramon electricians can protect your entire home with built in panel surge protection that works far better than the plug in outlet protectors available at the local home improvement store. At GENTEC, we take pride in our ability to protect you and your home from the potentially devastating effects of a power surge. When you call in our professional contractors, we’ll not only help you protect your valuable electronics, we’ll give you the peace of mind knowing that you’re protected from a surge based electrical fire. In addition to surge protection, we also offer full home wiring inspection service that can locate and repair potentially dangerous wiring issues. According to FEMA, “During a typical year, home electrical problems account for 26,100 fires and $1 billion in property losses. About half of all residential electrical fires involve electrical wiring.” With our service, you can be sure that you don’t become one of these statistics. But don’t just take our word for it. If you’re not sure that we are the best choice in San Ramon electricians, take a look at our service record. We’ve received a lot of positive feedback from our clients. While most of these comment on the professionalism and courtesy of our friendly staff, the other major common comment is that we are detail-oriented and explain everything we do in terms that are easy to understand. Our electricians work hard to make sure that we leave you with the best solution for your needs by using high-quality parts and equipment, and by using them right. We’re not in it for a quick buck – all of our electricians are in it for the long haul, and we want to make sure that all of our services are thorough, reliable, and long lasting. 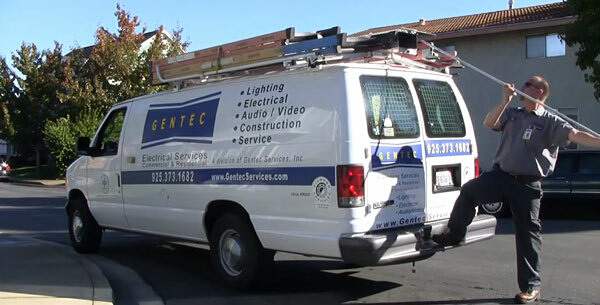 Gentec Electrical Services has been serving San Ramon for almost a decade, and we plan to keep going for years to come. Give us a call today and see the difference that a professional electrical service can really make.